The May 12, 2005 edition of the New York Post reported that a small building housing the Ritz Fur Shop was sold to developers who plan to raze it and build a new apartment tower with retail that could rise to 35 stories. I can't figure out exactly where this is. According to Mapquest, it is between 5th and 6th (though closer to 6th). There's a little crappy building between Mangia and Rue 57 with a small vacant lot next to it. I wonder if that's the site. Does anyone know? Last edited by londonlawyer; September 1st, 2005 at 03:22 PM. On the north side of 57th St-with the furs in the window!! Is it between 5th and 6th? How big is the building? I hope that the little crappy building and lot on the south side of the street get redeveloped. Ritz Furs is between 6th and 7th. The Russian Tea Room site is also supposedly to be developed into a hotel. The hundreds digit of a street address denotes how many avenue blocks East or West of 5th Ave. the building is located. Buildings numbering less than 100 are between 5th and 6th, 100-199 are between 6th and 7th, and so on. This building is obviously between 6th and 7th, Mapquest notwithstanding. Thanks, Derek. Is the Fox & Fowle project on the site that I referred to earlier? Is there any information about it? By the way, how do you know that this was revived? The tiny Ritz Fur Shop at 107 W. 57th St. is becoming a victim of the real estate market. The spot down the block from Carnegie Hall, where a gal could get a classy fur castoff from a society lady, is being sold to developers by its long-time family owners for what sources say is just shy of $25 million. Carlton Advisory Services, whose executives Brendan Sullivan and Charles Kerecz arranged a six-month loan for $28 million towards the purchase of the building and the air rights, say the new owners will tear it down. A 35-story project of 82,202 square feet with 37 tower residential units, three lower floors of office space and street level retail space could take its place. Thanks for posting the article, Stern. 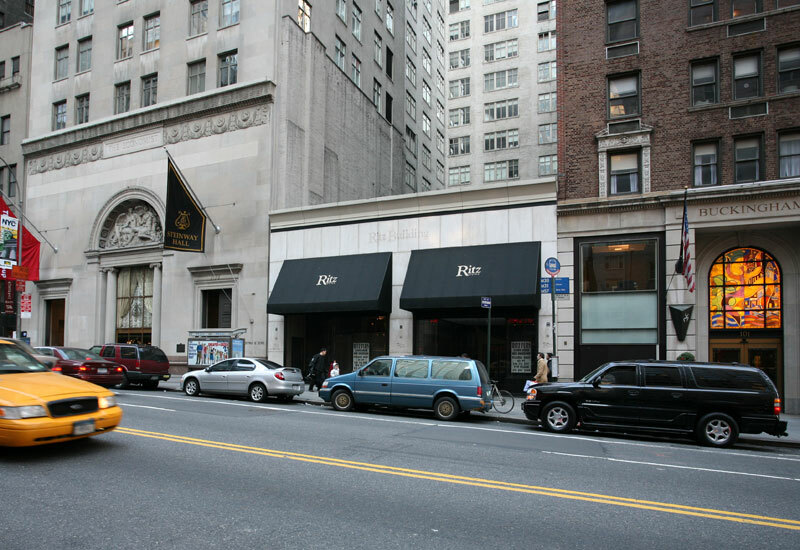 "Extell recently bought the one-story Ritz Furs shop on 57th Street between Sixth and Seventh avenues, as well as the transferable air rights. It plans to demolish the building and construct a 37-story condominium tower." Ritz Fur Shop at 107 West 57th Street. 18 December 2005.
works are showcased throughout Steinway Hall. Washington-based XM Satellite Radio opened midtown Manhattan broadcast studios and offices, creating a New York City base where it will produce specific shows and showcase talent. The New York City studio facility will be interconnected with XM's 80-plus-studio broadcast center in Washington. XM's 5,000-square-foot facility on the fifth floor of the Economist Building, at 111 W. 57th Street between 6th and 7th Avenues, will feature talk studios, production studios and several offices, with accommodations for 10 staff. The complex will begin broadcasting signal next Monday. The stately stone building has a long music history. Formerly known as the Steinway Building, it still houses the headquarters of the famed piano maker. Nice. Another one of NY's hidden treasures. Deserves a better neighbor than a second-hand coat store.